Anthony C. Thiselton’s Doubt, Faith, and Certainty is not a practical book. It does not teach Christians how to overcome their doubts, increase their faith and achieve certainty. Instead, it examines the definitions of each of those three terms, painting a complex, nuanced portrait of them using the colors of Scripture, theology and philosophy. The author is professor emeritus of Christian theology at the University of Nottingham, England. He is best known for his books on hermeneutics or interpretation, especially The Two Horizons. In addition to his hermeneutics books, he has published New Testament commentaries and several volumes on theological topics. Doubt, Faith, and Certainty’s purpose is to tease out their various meanings and functions. While defining terms is not, in and of itself, a practical enterprise, Thiselton states that it nevertheless constitutes “an immensely practical and potentially liberating pastoral and intellectual issue.” Read the book for yourself to see whether and how that’s true. Book Reviewed: Anthony C. Thiselton, Doubt, Faith, and Certainty (Grand Rapids MI: Eerdmans, 2017). P.P.S. This review was written for InfluenceMagazine.com and appears here by permission. According to research by The Pew Forum on Religion and Public Life in 2012, from 2007 to 2012, the percentage of Americans identifying themselves as Christians declined by 5 points, from 78 to 73. By contrast, the percentage of Americans identifying themselves as having no religious affiliation increased by 4.3 points, from 15.3 to 19.6. The so-called “nones” described their religious preference as atheist, agnostic, or “nothing in particular.” In contrast to “Christian” America, American “nones” are tend to be younger and more political liberal. The decline of Christian affiliation, the rise of religious non-affiliation, and the attendant shift in political values constitutes a missiological challenge for evangelical Christians. How do we evangelize and disciple in a culture that is increasingly post-Christian? Gary Tyra sets out to answer precisely that question in his new book, A Missional Orthodoxy: Theology and Ministry in a Post-Christian Context. Tyra is associate professor of biblical and practical theology at Vanguard University in Costa Mesa, California, and an Assemblies of God minister. (Full disclosure: He is also a personal friend and an occasional contributor to Enrichment, a journal for AG ministers that I edit.) His previous books include The Holy Spirit in Mission, Christ’s Empowering Presence, and Defeating Pharisaism. For Tyra, answering the missiological challenge of post-Christian America requires fidelity to two biblical imperatives: (1) “to contend for the faith that was once for all entrusted to God’s holy people” (Jude 3) and (2) to “become all things too people so that by all possible means I might save some” (1 Corinthians 9:22). 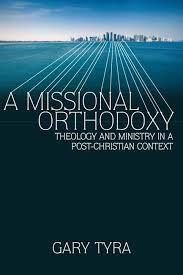 These imperatives are reflected in the words orthodoxy and missional in the book’s title. Although a Pentecostal, Tyra argues that fidelity to these imperatives ought to characterize evangelical Christianity generally, not just Pentecostalism. He develops this argument in dialogue with the writings of liberal Protestant Marcus Born and emerging evangelical Brian McLaren. He surveys their proposals on eight theological topics—Bible, God, Jesus Christ, Holy Spirit, human beings, salvation, church, and eschatology—and concludes that they, in varying degrees, sacrifice the orthodox imperative to the missional imperative. In other words, so concerned are they to make Christianity relevant to a postmodern generation, that they—especially Borg–reformulate doctrines in ways that conflict with both the Bible and the Great Tradition of Nicene orthodoxy. This doesn’t mean that Tyra is unsympathetic to their critiques, however. Indeed, Tyra concedes that they are correct in arguing that evangelical Christianity has sometimes sacrificed missional relevance to the demands of an arid orthodoxy. What makes Tyra’s missional orthodoxy such an attractive proposal is that it balances the imperatives of orthodoxy and mission in a way that steers between the Scylla of liberalism and Charybdis of fundamentalism. Take, for example, the topic of Christology. Whereas liberalism tends to emphasize the humanity of Christ at the expense of (even in the rejection of) his divinity, fundamentalism tends to emphasize the divinity of Christ at the expense of his humanity. According to Tyra, missional orthodoxy exposes this as a false antithesis, for the Bible teaches and the Great Tradition codifies that Jesus is fully divine and fully human in one person. Or take the topic of salvation. Whereas fundamentalism tends to emphasize the cross as the atoning sacrifice by which God forgives our sins, liberalism tends to emphasize the cross as a moral example of self-giving love. Again, this is a false antithesis, for the cross is both of these things. The implication of this is that Christian mission includes both evangelism and social action. Though I have simplified Tyra’s well-thought-out argument on these two topics for illustrative purposes, I think Tyra is basically correct in identifying the false antitheses that so often plague discussions of Christian mission generally and post-Christian mission specifically. Missional orthodoxy has the capacity “to be faithful to both the biblical text and the missional task,” as Tyra puts it. In a book of this size, covering as much theological ground as it does, it is inevitable that readers will disagree with this or that conclusion drawn by Tyra. Nonetheless, on the whole, the proposal is so well-grounded in the Bible that evangelicals of many stripes can unite under the banner of missional orthodoxy, which I take it was part of Tyra’s hope for the book. I only wish that Tyra had dialogued with representatives of the other side of the spectrum than Borg and McLaren. If, as Tyra contends, liberalism and fundamentalism are equal but opposite errors, it would be helpful to line them up side by side for purposes of contrast and comparison. My guess is that Tyra didn’t do this because at nearly 400 pages, A Missional Orthodoxy is already a long book, and because he had previously criticized fundamentalism in Defeating Pharisaism. I heartily recommend A Missional Orthodoxy to evangelical pastors—especially younger colleagues—who are struggling with the challenge of ministering within an increasingly post-Christian society. I think it would make an excellent textbook in an undergraduate Christian theology class. And while I would love to see it read by laypersons in Sunday school classes and small groups, my fear is that its length will be daunting for the average parishioner. Nevertheless, as Jesus said in an entirely different context, they who endure to the end will be saved. Or at least rendered more missionally orthodox. Letters typically begin with a greeting. Paul’s standard greeting is a wonderful way for Christians to begin their letters (or emails) to other people. For one thing, it perpetrates a little theology by defining who God is. He is “our Father,” that is, the Creator of the cosmos (Acts 17:28), the First Person of the Trinity (John 5:18), and the Adoptive Parent of all who believe in him (Eph. 1:5). Paul further describes God using the phrase, “Lord Jesus Christ.” The word Lord names Jesus’s divinity. He is the Second Person of the Trinity (Phil. 2:9-11, cf. Isa. 45:23). The word Christ names Jesus’s purpose. He is “the Messiah, the Lord”—the one whose coming into the world brings “good news of great joy to all people” (Luke 2:10,11). And finally, this Divine Person, this Promised Messiah is simple Jesus of Nazareth, who “died for our sins according to the Scriptures, …was buried, …was raised on the third day according to the Scriptures, and … appeared to [Peter], and then to the Twelve” (1 Cor. 15:3–5). For another thing, Paul’s standard greeting perpetrates a little soteriology—i.e., the doctrine of salvation—by identifying the source (grace) and result (peace) of God’s saving work in our lives. Charis means “favor,” and grace is God’s unmerited favor, his decision to love, redeem, forgive, and bless sinners who don’t deserve any of those things. “It is by grace you have been saved,” Paul writes in Ephesians 2:8. Peace has three dimensions: We have peace with God (Rom. 5:1), with one another (Eph. 2:14–18), and within ourselves (Rom. 8:6). The doctrine of God and the doctrine of salvation in the simple greeting of a letter! But here’s the kicker: In 1 Thessalonians 1:1—and there alone in the greeting of all his letters—Paul simply wrote, “Grace and peace to you.” He left out “from God the Father and from our Lord Jesus Christ.” Paul assumed the Thessalonians knew the ultimate source and result of God’s saving work. He had founded their church, after all (Acts 17:1–9). So why did he leave out the rich bits of theology and soteriology? Because it is one thing to wish God would give people his grace and peace, and another thing to give them your own grace and peace. Paul wants us to be Christians who don’t talk about God one way and then act toward people another way. He wants us to imitate God’s way of doing things in everything we do. So, grace and peace to you…from me. Please pass them along to others! See Rom. 1:7, 1 Cor. 1:3, 2 Cor. 1:2, Gal. 1:3, Eph. 1:2, Phil. 1:2, Col. 1:2, 1 Thes. 1:1, 2 Thes. 1:2; 1 Tim. 1:2, 2 Tim. 1:2, Titus 1:4, Phm. 1:3 for Paul’s standard greeting and its minor variations. 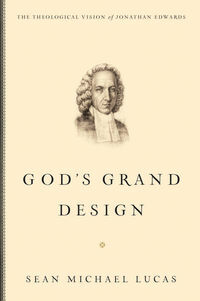 Sean Michael Lucas, God’s Grand Design: The Theological Vision of Jonathan Edwards (Wheaton, IL: Crossway, 2011). $17.99, 224 pages. First, Lucas has written an accessible introduction to the biblical theology and pastoral practice of “America’s greatest theologian”—as Robert Jenson described Edwards. Whatever their theological stripes may be, interested students of theology are in Lucas’s debt for this service. Edwards’s literary corpus is large and his thought complex, but Lucas ably guides his readers through Edwards’s theology, showing its narrative unity, comprehensive scope, and direct connection to pastoral practice. He illustrates this theology with well-chosen quotations from Edwards works, situating Edwards’s writings in their historical context. And Lucas appends an “Annotated Bibliography” of the best primary sources by and secondary sources about Edwards, so that readers new to Edwards can know what to read first. Second—and to my mind, most important—by offering this accessible introduction, Lucas offers contemporary pastors an Edwardsian model for how to integrate biblical theology into their own pastoral practice. This offer comes across explicitly in the appendix, “‘A Man Just Like Us’: Jonathan Edwards and Spiritual Formation for Ministerial Candidates.” But it is implicit throughout the rest of the book. Lucas’s intent for this book, in other words, is not merely historical. Rather, the history serves a larger purpose: namely, helping ministers better understand and practice their divine vocation. Lucas demonstrates the connection in Edwards’s ministry between what today we might call message and method. The message of the gospel is the desire of the Holy Trinity to take up creation into its own glory, a desire accomplished by the redeeming work of Jesus Christ and reflected by how Christians live. That life is characterized not merely by right beliefs or right actions but most important by right “affections” or “virtue.” The methods by which we promulgate this message must be appropriate to the end God seeks. Ministers, therefore, must call people to faith in Jesus Christ, a faith that produces an all-encompassing love for God and neighbor. The “means of grace” Edwards considered appropriate to this end were preaching, the sacraments (baptism and communion), and prayer. Obviously, as an Arminian, I have concrete objections to aspects of Edwards’s soteriology, for example, his anti-Arminianism. Lucas (quoting Gerald McDermott) notes that “Edwards’s struggle with Arminianism was but a battle in a life-long war with deism.” Edwards, it seems to me, routinely collapsed Arminianism into deism, even though no less than the evangelical Arminian John Wesley published an edited version of his Religious Affections. So, I must demur from many of Edwards’s conclusions. Nonetheless, and following Wesley’s example, it seems to me that religious affections might be a point of rapprochement between evangelical Calvinists and Arminians. Didn’t Wesley also speak of “heart religion,” after all? I doubt Lucas intended his book to produce such thoughts in Arminians, but it produced such thoughts in this Arminian. So, I affectionately recommend God’s Grand Design. Why Do Christians Leave the Faith? In reading through these testimonies, and understanding how many of the former Christians linked their departure from the faith to these intellectual and theological concerns, I started wondering if the Church has an incomplete appreciation of the role of apologetics. Typically, the defending of Christianity encompassed by apologetics is aimed at non-Christians, helping them to understand the faith as removing their objections to it. I accept that, but perhaps an even more useful role is with existing Christians, helping them to think through these issues from a Christian perspective. I am struck by how much these accounts resonate with sociological theories of human relationships, especially those coming from social exchange theory. This theory describes humans as judging the value of relationships in terms of costs and benefits. One variation of social exchange theory, termed equity theory, holds that people are satisfied with their relationships when they get the rewards that they feel are proportional to the costs that they bear. An inequitable is unstable, and it usually occurs because a person thinks they receive too little for how much they give.Many of the testimonies given by former Christians described a broken relationship with God as one might talk about a marital divorce. They are emotional, even bitter at times. They contain the language of inequality. The writers did so much for God – praying, attending church, following God – but God did not do enough in return. Author georgepwoodPosted on December 2, 2011 December 2, 2011 Categories UncategorizedTags apologetics, apostasy, Bradley Wright, deconversion, disappointment with God, theology, trite answers, unanswered prayerLeave a comment on Why Do Christians Leave the Faith?